Pibbin….that little frog has to be the cutest little guy and I would want him as a friend. In Pibbin the Small ( remember my review of that book here)….he had to leave his nice and cozy Friendship Bog…to find some medicine for his friend…. It’s time for a party…..Gaffer’s birthday party….and Pibbin begins the story with a visit to see Gaffer. Unlike our parties where we take a gift to the birthday person….in this story, the person celebrating their birthday gives a gift to others. However, Pibbin discovers…that Gaffer’s Story Shell ( a sea shell) is missing! Without the Shell…Gaffin may not be able to tell the story!!!! Pibbin’s adventures take him throughout the Bog…into some dangerous situations…. This is another story about courage and loyalty….amazing ways to encourage your children to truly understand how to be a good friend during difficult times! 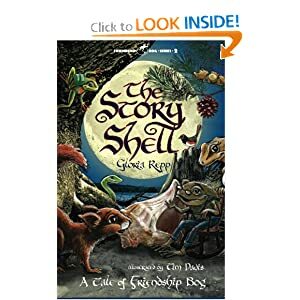 My children were sad when we finished this book (on the third day of reading it)….because….now, we have to wait until Gloria Repp writes another one. However, I leave it lying around. After all..my little guy still likes picking it up and showing off his ability to pick and peck at new words he is learning…and quite often, he will ask me what I think Pibbin is up to….and we’ll start our own story…our own adventure, imaging what our sweet friend is doing and who he is helping!!! What are some of your favorite books that encourages good friendship/character? Have you fallen in love with Pibbin, too? **Disclaimer: We received a free copy of The Story Shell in exchange for our honest opinion. No other compensation was received. « Can You Release Them To God? Thank you again. My ‘mom friends’ will love this too! Laura, Thanks…that’s odd….the link worked fine here…I’ll try it again. Oh my…..something did happen! Thank you so much for letting me know! I think I fixed it! It works on the link, but still gives a 404 on the graphic for me. Tech stuff gets frustrating huh? I really enjoy your blog and am glad to have discovered you! Oh, I forgot about the picture! Thanks! I’m glad you enjoy it….but, tell me…what about it do you like…I’m considering some changes…. send any recommendations to: momsmustardseeds@gmail.com THANKS! I’ll get right on that picture! This looks like a very cute book! What age group would you say it is for? Would my 3rd grader be able to read it on his own? Amazon doesn’t say. Thanks girl! I would say…an early reader would struggle a little….but a 3rd grader should be able to read it..though, mine still struggles a little…but, we all enjoyed it a great deal! We’ll have to check these out when we are done. Thanks for sharing! Kelli, that sounds like a GREAT book…I really need to look into it…and wow, what a great friend you are….always lifting up your sisters and encouraging them…I’m sure you were doing that behind the scenes when she was writing it! Can’t wait to see you next month!!!!!!! !